Pulmonary Arteriovenous malformation (PAVM) is a relatively rare disorder with rather a common presentation. Patients may present with hemoptysis, shortness of breath, and hypoxemia signs and symptoms which are common to many other pulmonary diseases. PAVM can be simple/complex, single/multiple, and primary/secondary. Pulmonary hypertension, past or present chest trauma or surgery and liver cirrhosis are few conditions which predispose to secondary PAVM. A high index of suspicion for this condition among high-risk patients who present with hemoptysis aids in narrowing the differential and can lead to better outcome. Conditions such as lung granuloma and lung cancer have been reported to be mimicking PAVM., Early identification can result in successful treatment by percutaneous or surgical intervention. We present a case of PAVM, which was picked up on a chest X-ray done in a patient with hemoptysis who presented to the emergency department (ED) of a Medical College Hospital in South India. Recognizing the classical X-ray picture of PAVM can be insisted during teaching an approach to hemoptysis and dyspnea in general practice. A 50-year-old gentleman chronic smoker and known case of rheumatic heart disease (RHD), presented to the ED with exertional dyspnea New York Heart Association (NYHA) Grade II for the past 3 years which progressed to NYHA Grade IV dyspnea for 4 days. He presented to ED with a spurious hemoptysis of about 400 ml. He was not on regular follow-up for RHD and refused any history of fever. On examination, his pulse was 160/min irregularly irregular, blood pressure was 110/70 mm of Hg, respiratory rate was 40/min, and oxygen saturation by pulse oximetry was 79% on room air which improved to 83% on high flow oxygen. On auscultation of the chest, there was equal air entry with fine basal crepitus bilaterally, a pansystolic murmur with a loud P2. Jugular venous pressure was elevated. No pallor, no icterus, and no pedal edema were noted. An electrocardiogram revealed atrial fibrillation. 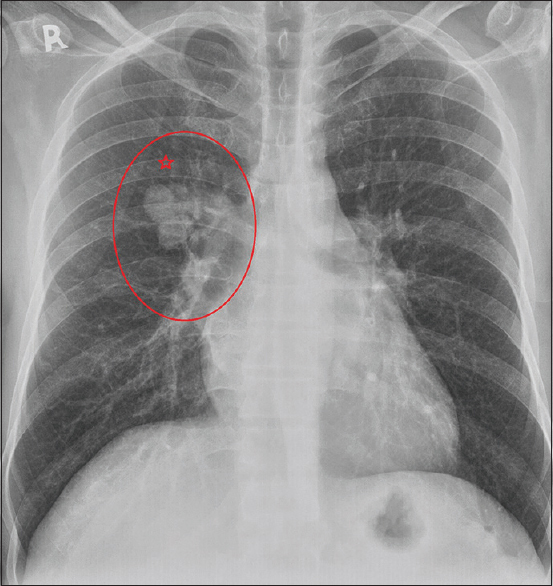 A chest X-ray showed cardiomegaly with a classical cherry shaped opacity in the right para-hilar region [Figure 1]. An echocardiogram done was reported as a normal systolic left ventricular function with an ejection fraction of 54%. It also revealed severe mitral stenosis with moderate mitral regurgitation and mild aortic regurgitation. Computed tomography (CT) thorax with pulmonary angiography confirmed an arteriovenous (AV) malformation between the segmental branches of the right pulmonary trunk and right superior pulmonary vein [Figure 2]. Transseptal closure of the PAVM was performed and hemoptysis resolved after surgery. A chest X-ray done few months after the procedure showed resolution of AVM [Figure 3]. An informed consent was obtained from the patient. PAVM is a rare condition, the etiology of which can be vary from congenital hereditary hemorrhagic telangiectasia (HHT) to secondary causes such as postthoracic surgery, liver cirrhosis, penetrating chest trauma, and chronic pulmonary hypertension., The most common association was hepatic cirrhosis, whereas less common associations were penetrating chest trauma, mitral stenosis, Fanconi's syndrome, schistosomiasis, actinomycosis, metastatic thyroid carcinoma, and as a complication of open thoracic surgeries. Its association with HHT has been commonly reported in the past, and patients with chronic, unrelenting cough with a history of HHT are screened for PAVM using CT angiography. Common clinical presentations of PAVM were dyspnea, hemoptysis, and chronic cough while cyanosis and clubbing were common clinical observations., PAVM's appear as rounded, soft-tissue nodular opacity, frequently of 1–2 cm diameter on a chest X-ray with or without a dilated, and tortuous anastomosis between an artery and vein. These findings although classical of AVMs, may mimic other pulmonary disorders. 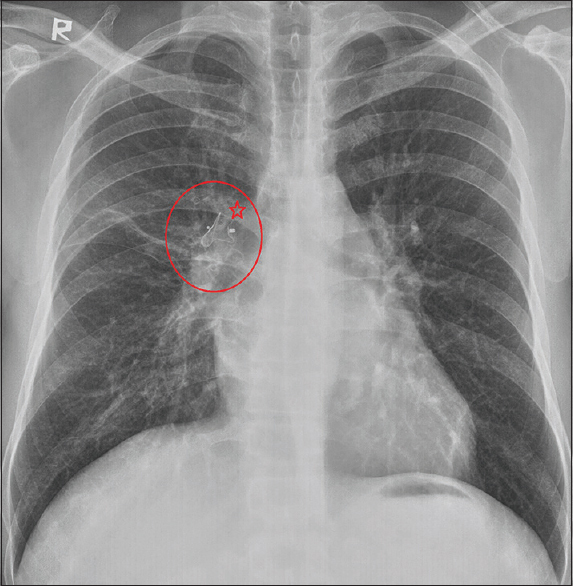 Two reports published in Japan in the year 2011 and 2015, where the preoperative diagnosis on chest imaging was made as PAVM but histopathology was suggestive of an alternative diagnosis, in the above-mentioned cases lung cancer and lung granuloma, respectively., CT of the chest with or without angiography provides more accurate imaging information and contrast-enhancement aids in identifying the feeding and draining vessels and also shows the presence of mural thrombus if any. Percutaneous transcatheter embolization of the AVM is the recommended treatment modality with minimal complications. Extrapulmonary manifestations of PAVM could involve the central nervous system. Paradoxical emboli from mural thrombus, causing a transient ischemic attack, stroke, or brain abscesses have been reported., Congenital PAVM presenting in adult life associated with valvular heart disease, particularly mitral stenosis was also reported. In this case, the patient was known to have mitral stenosis presented with exertional dyspnea and spurious hemoptysis, whose chest X-ray showed a classical cherry aneurysm which prompted further evaluation for a possible PAVM. CT thorax confirmed the diagnosis, and he was successfully treated by percutaneous transseptal embolization. Our patient was also advised surgery for severe mitral stenosis, but he lost to follow-up with the cardiovascular department. Pulmonary AV malformation is a rare disorder and a rare cause of hemoptysis caused by congenital or acquired lesions in the lungs. All patients presenting with hemoptysis and having risk factors for secondary PAVM should have a chest X-ray done as part of the primary evaluation. A chest X-ray with the classical cherry aneurysm is classical although not confirmatory. CT of thorax with angiography is the gold standard imaging modality. Percutaneous transcatheter embolization of the fistula is standard treatment with a good outcome. Knowledge about this rare condition and its classical chest X-ray findings should be highlighted during education on approach to hemoptysis. Iqbal N, Rehman KA, Khan JA, Haq TU. Pulmonary arteriovascular malformation: A rare cause of unexplained hypoxia and acute dyspnoea in young patients. BMJ Case Rep 2014;2014. pii: Bcr2014207222. Jutant EM, Puyo P, El Hajjam M, Blivet S, Houdart E, Aubier M, et al. Severe, chronic cough caused by pulmonary arteriovenous malformations in a patient with hereditary haemorrhagic telangiectasia: Case report. BMC Pulm Med 2015;15:28. Lacombe P, Lacout A, Marcy PY, Binsse S, Sellier J, Bensalah M, et al. Diagnosis and treatment of pulmonary arteriovenous malformations in hereditary hemorrhagic telangiectasia: An overview. Diagn Interv Imaging 2013;94:835-48. Choi KH, Park SJ, Min KH, Kim SR, Lee MH, Chung CR, et al. Early-stage lung cancer mimicking pulmonary arteriovenous malformation. Am J Respir Crit Care Med 2011;183:1572-3. Meek ME, Meek JC, Beheshti MV. Management of pulmonary arteriovenous malformations. Semin Intervent Radiol 2011;28:24-31. Anticoli S, Pezzella FR, Siniscalchi A, Gallelli L, Bravi MC. Pulmonary arteriovenous malformation as a cause of embolic stroke: Case report and review of the literature. Interv Neurol 2015;3:27-30. Moradi M, Adeli M. Brain abscess as the first manifestation of pulmonary arteriovenous malformation: A case report. Adv Biomed Res 2014;3:28. Kondoh H, Sato F, Shintani H. Simultaneous treatment of pulmonary AV malformation with rheumatic heart disease. Thorac Cardiovasc Surg 2009;57:174-6.